Dance That Sticks to the Roof of Your Feet! 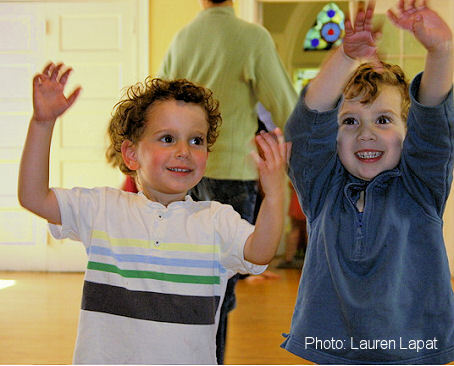 PEANUT BUTTER & JELLY DANCE CLASSES FOR KIDS teaches a “creative movement” approach to dance that sees dance as an art form to be explored, examined, responded to, created, and discovered. Learning a wide range of movements allows children to make their own dances and ‘own’ movement as dancers. Fostering the love of moving and dancing is a chief goal. We teach to the dancer/artist in every child. The activity and fun of dance develops the brain in new ways, teaches self-discipline and promotes self-confidence. It is our aim that with increasing experience, our students will make their dancing expressive and impressive. Click here for more about the importance of dance education for all children. All classes begin with dance warm-up exercises, followed by creative, improvisational challenges, story dances, free dances, prop dances or good bye solos that explore movement themes like shapes or levels. 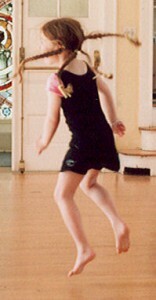 As students mature, more dance technique is added to the curriculum, and classes include more exacting dance warm-up exercises and simple patterns, teaching skills such as turning, jumping, or lifted posture. All clas ses create beautiful improvisational dances as well as set pieces. The final class of each session will be a performance for parents. Come and see us fly! Our classes are returning to the Church of Our Saviour, at 25 Monmouth St, in Brookline, MA. This is south of Beacon Street. Easy access by T – near Longwood stop on the D line or the St. Mary’s stop on the C line. Street parking is available. Click here to view our map. Dancers will prepare a short piece for session last day showing or year end concert. Call for information about joining this program. Tuition does not include tickets to outside concerts or costumes. 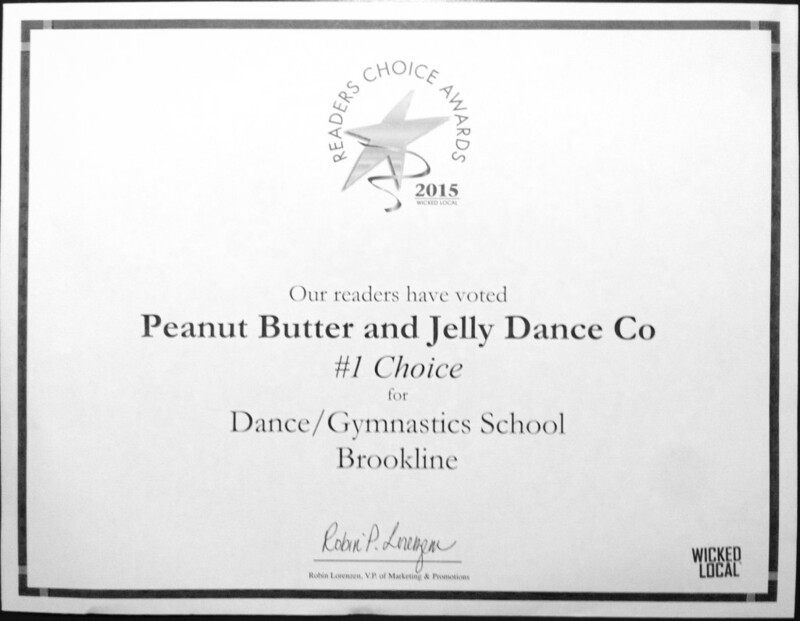 PB&J Dance Classes for Kids won Reader’s Choice Award in 2015! Thanks to all who voted for us. SCHOLARSHIPS: No child will be prevented from participating for economic reasons. There are scholarships available for our classes. Please call for details and application: 617-738-7688. REGISTRATION: All registration is now via the web (registrations). Please contact us if you need paper registration materials. Places in class are first-come-first-serve in the Fall Session. During the Winter and Spring Session previously enrolled dancers have priority. ROLLING ENROLLMENT: Children may register during the session at a pro-rated tuition. TUITION DISCOUNTS: Referral Discount for Currently Enrolled Students: Send us a new friend and when you both enroll you both get a discount of $10! TEACHER: JEANNE TRAXLER was an original founder of the PB&J Dance Company in Cincinnati, Ohio in 1976 and in Massachusetts in 1980. She teaches PB&J Dance Classes for Kids and co-directs the SMALL FEETS dance company. Jeanne is also involved in dance and the Child international, an organization whose mission is to increase and develop opportunities for young people to experience dance as creators, performers, and spectators throughout the world. She was the USA Chapter National Treasurer and has taught for daCi at the international meeting in Finland in 1997 and at three National Dance Education Organization (NDEO) conferences. She is also a founding member and on the organizing committee of the Children’s Dance Festival, an annual day of dance workshops and performances for and by children. Jeanne has taught workshops for all of the Dance Across the City days, the Dance for World Community Festival, and at the Wang Theater’s Artropolis program. She has also choreographed six elementary school musicals in Brookline, for one of which, she collaborated on lyrics for the original music. Her choreographic work has received grants from the Massachusetts and Brookline Arts Council. In 2018, Jeanne was named the Boston Dance Alliance Dance Champion for her work with the youngest dance students. When classes are above ten students we will also have an assistant teacher. Thank you for such a great Creative Movement program. We were very fortunate for such a wonderful, enthusiastic teacher! My daughter can’t imagine not dancing with Jeanne! My daughter took Jeanne’s classes for a couple of years, and I’ve guest taught for her and known her for years. I can vouch unreservedly for her creativity, soundness of approach, and general good sense about life and art. $350 Tu CREATIVE MOVEMENT - 18 Week Winter/Spring Session $360 extrasmall feets - 18 Week Winter/Spring Session SMALL FEETS - call to join this program - Winter/Spring Tuition $400 (all tuitions will be prorated for late start) Late Start Prorated Tuition - Contact our office. Scholarship Needed - Contact our office. Please enter the text you see to the right.